Is anyone here from Indiana? Hope so, because I'll be appearing on WNIT's Dinner and a Book television show on April 23rd, but the show broadcasts only in Indiana. I'll get a copy of the program, and when I do (the week it airs, I believe) I'll post it on my website. What a fun experience. We had TelePrompTers and three cameras and even an audience. The host of the show, Gail Martin, couldn't have been nicer. Brenda, the director, Angel, Paul, and so many others were supportive and just plain fun to hang out with. I had a blast, can you tell? Anyway, as Gail and I talked about the White House Chef series and the Manor House series, we made dinner. And of course we used recipes from Buffalo West Wing! Gail prepared a Greek salad, and Nantucket sea scallops. I prepared hummus and creamed spinach with olive oil and shallots. We finished off with the Triple Berry Cobbler that Gail had prepared ahead of time. Too fun. I should have taken pictures between segments, but I forgot. I think I was just too nervous and excited to think about anything else but not looking like a goofball on camera. You will need a sturdy cast iron skillet or equivalent. You want something with a heavy bottom that will evenly distribute the heat from your cooktop, and not have hot spots that might burn the scallops. Place the pan on a burner set on medium-high heat. Place the canola oil in the bottom of the pan with the butter. Mix together as the butter melts. Toss in the minced garlic and give the pan a stir. Let the oil heat up until it is hot, but not smoking. You can test the surface to see if it’s hot enough by carefully dropping a drop of water into the pan. If it sizzles and dances across the surface, the oil’s hot enough. Using tongs, transfer the scallops to the prepared hot oil in the pan. Let brown for roughly 2 minutes, then turn to brown the other side. Remove cooked scallops from skillet onto warmed plates. Season with salt and pepper, to taste. Serve on a bed of Creamed Spinach with Olive Oil and Shallots (below). Put olive oil in a sturdy cast iron skillet or equivalent over medium-high heat. When oil is hot, add shallots, stirring until they are clear, about 1 minute. Add spinach, and continue stirring until mixture is heated through and reduced and wilted, about 2–3 minutes. Remove from heat. In a large skillet, melt the butter over medium heat. Add flour and whisk vigorously until a smooth bubbling paste forms, about 1 minute. Slowly whisk in the liquid. Keep stirring until you have a thickened sauce. Add the nutmeg and salt and pepper, to taste. Whisk. Add in the spinach mixture. Stir to coat. Plate. Top with grated cheese. Serve. My husband commented at least three times about how great this meal was. He's not much of a seafood eater, so this was high praise indeed. And he liked the spinach so much, he finished it. I really should have made more! Would have been a nice leftover for lunch today! These are really super easy to make. And they take surprisingly little time. Try it! Oh, Julie, what fun! "Dinner and a Book" is a truly inspired idea for a talk show. I'll be watching your site for the program. It sounds like you had a great time, and the "dinner" part sounded delicious, too. Thank you for sharing both with us today and have a great weekend. My DH loves scallops and loves spinach. I now have something wonderful and new to cook for him! Thank you, Julie! The program sounds terrific too. The show sounds great...wish we had one in our area. I also love this recipe. I'll have to use Almond Breeze in the spinach but I'll bet it will be a good combination. Thanks. Sounds like you've taken on TV with poise! Can't wait to see the clip. Thanks for the recipe--this sounds like something new and fun for me to fix here! Thanks, Cleo, MJ, and Elizabeth. This is great because it's so easy. Erika - what's Almond Breeze? I'm going to have to look that up! Aha! Found it! A milk substitute. I should have figured that one out before asking. My brain is already on weekend mode! Oh - I bet almond milk would be excellent in the spinach ... I make a chick pea cutlet that I think would be good served with this yummy spinach. Will give it a go this weekend and will post the cutlet recipe for my next post (assuming it works). Oooh.. looking forward to your cutlet post! I'm sure it'll be great! 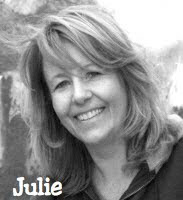 Julie, can't wait to see the tape of Dinner and A Book. Sounds fun. And what a lovely recipe. I adore scallops! Julie! You're officially a TV star! How very exciting. I'm so glad your dish came out well. I'm sure I'd have dropped that cast iron pan on my foot! Congratulations for your nomination and for your participation in the show. I love seafood and spinach. The photo whetted my appetite. Avery and Krista - it was so much fun. Can't wait to go back. Danielle - thank you so much! Hope you enjoy. It's really super easy to make!